He mob howled for vengeance, the missiles raining down on the synagogue walls as the worshippers huddled inside. It was a scene from Europe in the 1930s – except this was eastern Paris on the evening of July 13th, 2014. Thousands had gathered to demonstrate against the Israeli bombardment of Gaza. But the protest soon turned violent – and against Jews in general. One of those trapped told Israeli television that the streets outside were “like an intifada”, the Palestinian uprising against Israeli occupation. Some of the trapped Jews fought their way out as the riot police dispersed the crowd. Manuel Valls, the French Prime Minister, condemned the attack in “the strongest possible terms”, while Joel Mergei, a community leader, said he was “profoundly shocked and revolted”. The words had no effect. Two weeks later, 400 protesters attacked a synagogue and Jewish-owned businesses in Sarcelles, in the north of Paris, shouting “Death to the Jews”. Posters had even advertised the raid in advance, like the pogroms of Tsarist Russia. France has suffered the worst violence, but anti-Semitism is spiking across Europe, fuelled by the war in Gaza. In Britain, the Community Security Trust (CST) says there were around 100 anti-Semitic incidents in July, double the usual number. The CST has issued a security alert for Jewish institutions. In Berlin a crowd of anti-Israel protesters had to be prevented from attacking a synagogue. In Liege, Belgium, a café owner put up a sign saying dogs were welcome, but Jews were not allowed.Yet for many French and European Jews, the violence comes as no surprise. Seventy years after the Holocaust, from Amiens to Athens, the world’s oldest hatred flourishes anew. For some, opposition to Israeli policies is now a justification for open hatred of Jews – even though many Jews are strongly opposed to Israel’s rightward lurch, and support the establishment of a Palestinian state. One weekend in May seemed to epitomise the darkness. On May 24th a gunman pulled out a Kalashnikov assault rifle at the Jewish Museum in Brussels and opened fire, killing four people. 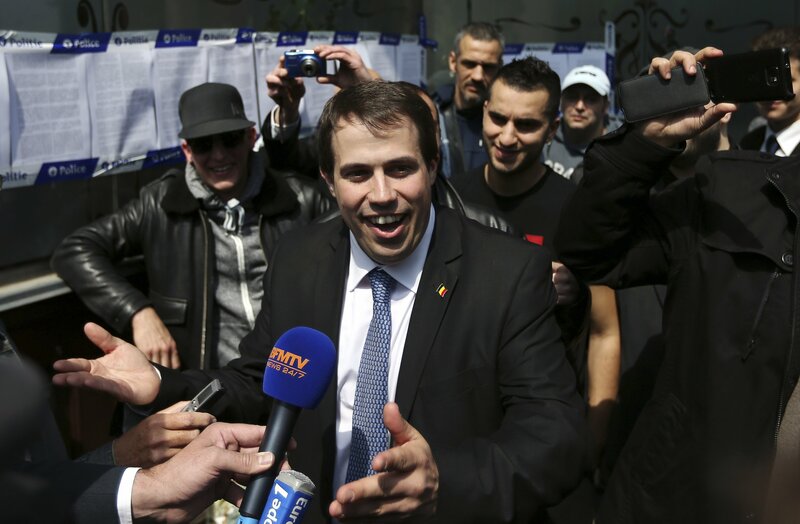 The next day the results of the elections to the European parliament showed a surge in support for extreme-right ­parties in France, Greece, Hungary and Germany. The National Front in France won the election, which many fear could be a precursor to eventually taking power in a national election. Perhaps the most shocking result was the surge in support for Golden Dawn in Greece. The party, which has been described as openly neo-Nazi, won almost 10% of the vote, bringing it three members of the European parliament. In parts of Hungary, especially the impoverished north and east, Jobbik is the main opposition to the governing right-wing Fidesz. Jobbik won 14.7% of votes at the European elections. The party denies being antisemitic but even Marine Le Pen, leader of the French National Front, ruled out cooperating with them in the European parliament. Some saw the Brussels attack and the election results as dark portents. “At what point,” asked Jeffrey Goldberg, a prominent American Jewish journalist, “do the Jews of America and the Jews of Israel tell the Jews of Europe that it might be time to get out?” Around now, it seems. A survey published in November 2013 by the Fundamental Rights Agency of the European Union found that 29% had considered emigrating as they did not feel safe. Jews across Europe, the survey noted, “face insults, discrimination and physical violence, which despite concerted efforts by both the EU and its member states, shows no signs of fading into the past”. Two-thirds considered anti-Semitism to be a problem across the countries surveyed. Overall, 76% said that anti-Semitism had worsened over the past five years in their home countries, with the most marked deteriorations in France, Hungary and Belgium. The European Jewish Congress has now set up a website, sacc.eu, to give advice and contacts in the events of an attack. A survey by the Anti-Defamation League (ADL) in New York found similar results. The ADL Global 100 surveyed 53,000 adults in 102 countries. It found that 26% held deeply anti-Semitic attitudes, answering “probably true” to six or more of 11 negative stereotypes of Jews. The highest levels of prejudice were found in the Arab world, with the Palestinian Terri Hungary 41%. The Czech Republic was lowest at 13%. But the picture is more complex than the survey suggests. Malmo, Sweden’s third-largest city, is one of the most unsettling places in Europe for Jews. Anti-Semitic attacks tripled between 2010 and 2012, when the community, around 700-strong, recorded 60 incidents. In October 2012 a bomb exploded at the Jewish community centre. Jewish leaders accused Ilmar Reepalu, who served as mayor between 1994 and 2013, of inflammatory comments. Reepalu called for Jews to distance themselves from Zionism, and claimed that the Jewish community had been “infiltrated” by the Sweden Democrats party, which has its roots in the far-right. Reepalu has denied being anti-Semitic. But his remarks provoked a storm of protest and he was forced to retract them. Hannah Rosenthal, the former US Special Envoy for combating anti-Semitism, said Malmo was a prime example of the “new anti-Semitism” where hatred of Israel is used to disguise hatred of Jews. It is not anti-Semitic to criticise the Israeli government or its policies towards the Palestinians, say Jewish leaders. A reasoned, open debate on the conflict is always welcome – especially now, when passions are running so high over Gaza. But the morbid obsession with the only democracy in the Middle East, they say, its relentless demonisation and the calls for its destruction are indicative of anti-Semitism. In 1997 I wrote a book about Muslim minorities in Europe, called A Heart Turned East. It was optimistic, and, with hindsight, naïve of me. I travelled across France, Germany, Britain, Turkey and Bosnia. I hoped then that a tolerant, modern Islam could emerge in Europe, in the Ottoman tradition. The Ottomans had not been perfect, but they had been comparably tolerant – especially in comparison to the Catholic church. In France I met Muslim intellectuals, exiles and artists. They were resentful of their second class status, and had been scarred by racism and discrimination. But their anger was directed at the French authorities and they were keen to co-exist with their Jewish compatriots. So what went wrong? The undercurrents had long been swirling, but had been little noticed. They date back to the Islamic revolution in Iran, the siege of Mecca and the Soviet invasion of Afghanistan in 1979, says Ghaffar Hussain, of the Quilliam Foundation, a counter-extremism think-tank in London. “Islamist extremism experienced a global upsurge post 1979. These events played into the hands of Islamists.” That anger was further fuelled by the Bosnian war, which helped nurture a global Muslim consciousness. Jews, Muslims, African and other immigrants once lived in reasonable harmony in the banlieues, sharing hard time. La Haine (Hate), a hugely successful thriller directed by Mathieu Kassovitz, released in 1995, starred three protagonists: one Jewish, one Afro-French and a third from a North African family. The violence and brutality are experienced by all three friends. Such a film is nearly unimaginable nowadays. The turning point came in January 2006 with the kidnapping and murder of Ilan Halimi. A 23-year-old mobile telephone salesman, Halimi was lured into a honey-trap, abducted and held for three weeks in Bagneux, outside Paris. There he was tortured while his abductors telephoned his family, so they could hear his screams. Youssouf Fofana, the leader of the gang, was later sentenced to life imprisonment. Many blame the controversial comedian Dieudonne and his “quenelle”, supposedly a modified version of the Nazi salute, for fuelling hatred. Social media are awash with his followers, performing the quenelle in front of synagogues, Holocaust memorials, the school in Toulouse where three Jewish children and a teacher were murdered and even at the gates of Auschwitz. Dieudonne denies that the gesture is anti-Semitic. 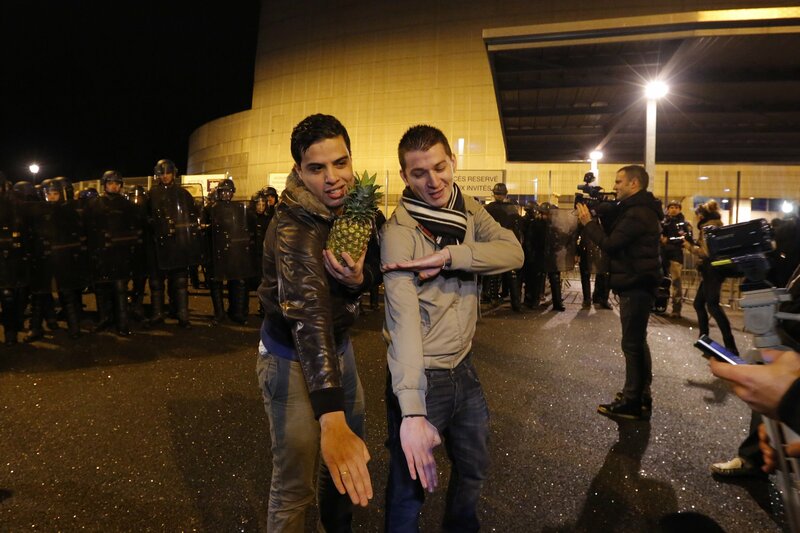 The quenelle, he says, is a “gesture of liberation” from slavery. Dieudonne is also the creator of the “ShoahNanas” (Holocaust Pineapples) song, which he sings, accompanied by a young man wearing a large yellow star over a pair of pyjamas. Now a new ingredient has been tossed into the cauldron: the wars in Syria and Iraq. The French government estimates that 800 jihadists are fighting in Syria, accompanied by several hundred from Britain. Among their number was Mehdi Nemmouche, who is accused of the attack on the Brussels Jewish museum. French police found he had in his possession a Kalashnikov assault rifle and a pistol, which they believed were used in the attack. Together with the weapons, police found a white sheet emblazoned with the name of the Islamic State of Iraq and the Levant (Isis), the militia judged too extreme even for al-Qaida, which has captured large swathes of Iraq. The murders have not dampened anti-Jewish hatred. On the contrary, they seem to have inflamed it. The spike in anti-Semitism has seen emigration to Israel soar. In 2011 and 2012 just under 2,000 French Jews emigrated to Israel. Across Europe Jewish communities are investing in security infrastructure and boosting protection. After the Toulouse attacks, the Jewish Agency established a Fund for Emergency Assistance. So far it has distributed almost $4m to boost security at 116 Jewish institutions in more than 30 countries. In Britain the government pays £2.5m a year for security guards at Jewish schools. So far, British Jews have not suffered a terrorist attack like Toulouse or ­Brussels, but not for want of jihadis trying. In 2011 Somali troops shot dead an al-Qaida leader in Africa when he tried to ram his car through a checkpoint. Documents found inside his car included detailed plans for attacks on Eton College, the Ritz and Dorchester hotels, and the Golders Green and Stamford Hill neighbourhoods of London, which have large Jewish populations. The following year nine British jihadis were convicted of plotting terrorist acts including the potential targeting of two rabbis, and a husband-and-wife team from Oldham, north England, were convicted of plotting terrorist attacks on Manchester’s Jewish community. Yet the picture is not all bleak. In Berlin and Budapest Jewish life is flourishing. The epicentre of the Holocaust seems an unlikely centre for a Jewish renaissance. But the German capital is now home to one of the world’s fastest-growing Jewish communities, tens of thousands strong. There is a growing sense, particularly among younger Germans, that the city is incomplete without a Jewish presence, especially in the arts, culture and literature. The glory days of the pre-war years can never be recreated, but they can be remembered and used as inspiration for a new form of German-Jewish culture. Berlin’s Jewish revival is boosted by influxes from Russia and a growing number of Israelis who have applied for German passports. Hungary is home to the region’s largest indigenous Jewish community, usually estimated at between 80,000 and 100,000, although perhaps a fifth of that number are affiliated with the Jewish community. Still the city is home to a dozen working synagogues, a thriving community centre, kosher shops, bars and restaurants and each summer hosts the Jewish summer festival, which is supported by the government and the municipality. District VII, the traditional Jewish quarter, is now the hippest part of town, home to numerous bohemian “ruin-pubs”. Communal life was moribund under Communism. Until recently, the ­Jewish establishment was perceived by many as insular and self-serving. Only now are a new generation of activists such as Adam Schönburger revitalising Jewish life, in part by focusing on cultural, social and ethical issues, rather than religion. Schönburger is one of the founders of Siraly, a Jewish cultural centre that will re-open later this year. The result is a new confidence among many Hungarian Jews and a pride in their heritage. So much so that they are boycotting the government’s Holocaust commemoration events, accusing the government of whitewashing the country’s collaboration in the Holocaust – which the government strongly denies, pointing out that numerous officials, including the president, have admitted Hungary’s responsibility. Few of the angry youths of the banlieues know that Muslims and Jews share a common history, of tolerance and co-existence. Jewish life flourished under Islamic rule in Spain, an era known as the Golden Age, which produced some of the most important works of Jewish scholarship and a flowering of knowledge and science. Jews served as advisers to the Muslim rulers, as doctors, lawyers, teachers and engineers. Although there were sporadic outbreaks of violence, Jews living under Muslim rule in medieval times were far more prosperous, secure and integrated than those in Christian Europe. When in 1492 the Jews were expelled from Spain, the Ottoman Sultan Bayezid II was so incredulous that he sent a fleet of boats to collect them. Such a prize, of doctors, lawyers, scientists and traders, could not be allowed to slip by. “Do they call this Ferdinand a wise prince who impoverishes his kingdom and enriches mine?” he asked. The Jewish immigrants settled across the Ottoman empire, from Salonika to Baghdad.